A discussion in two parts, with Kay Kallos, Dallas Public Art Program Manager, covers the inception and objectives of the integrated artwork at the newly opened Main Street Garden in Dallas. Artist Leni Schwendinger discusses her new work, SpectraScape, at the new Main Street Garden Park located at 1902 Main Street in downtown Dallas. 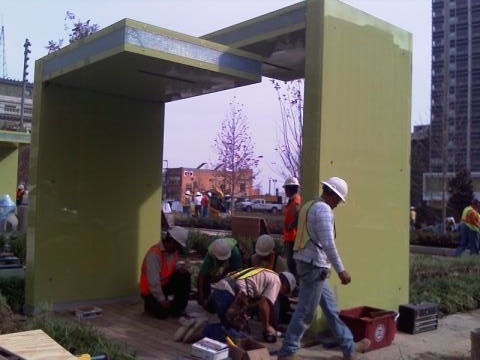 SpectraScape is a site-specific artwork comprised of bands of light that scroll across the green glass study shelters at Main Street Garden Park. SpectraScape refers to the garden through the use of four seasonal color palettes derived from the seasonal park plantings—rust and gold for fall, pink, yellow and green for summer, green, blue, and white for winter and green and yellow for spring. Each season is proclaimed through rhythmic sequences of colors and tones that race across the tops of the study shelters.